Write a function compute_letter_grade() which takes a number grade and returns the corresponding letter grade. Write a function calc_letter_grade() which takes a student as input and returns a list of tuples where the first part of the tuple is the course code and second part of the tuple is the letter grade. From the student structure, first extract the course list which is a list of tuples of course codes and the number grades. Get the number grades from the course list and create a new list in which each number grade is converted to a letter grade. Recreate a new courses list with the list of courses and the list of letter grades. To calculate Grade point average (GPA) the letter grade for each course and the quality points for each letter grade are required. 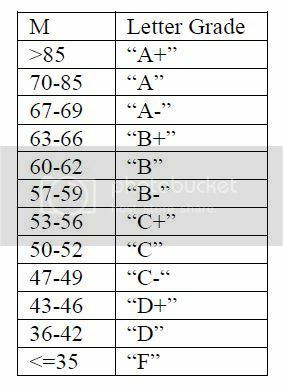 Each course has a corresponding credit weight associated with it and each letter grade has a corresponding quality point associated with it. For each course a student has taken a grade point is calculated by multiplying the quality point associated with the letter grade that the student has gotten by the credit weight for that course. The GPA is calculated by dividing the total grade points of all courses by the total amount of credit hours. Write a function calc_gpa() which takes a student record and calculates the gpa for the student. First extract the list of tuples of course codes and number grades and create a list of tuples with course codes and letter grade. Then create a list of corresponding wt and qp for each course code and letter grade, this can be created by applying convert_to_wtqp() to each element of the course code and letter grade list. Accumulate grade_points and credit_weights as shown in the table above and divide total grade points by total credit weights to calculate the Grade Point Average (GPA). Use the function print_students_gpa(),which takes a student record as a parameter, to print the student’s GPA. """Returns a list of tuples of course codes and grade"""
"""Returns course code part of the tuple"""
"""Returns grade part of the tuple"""
"""Prints the students details and GPA"""